What you choose to eat for breakfast has a huge impact on how the rest of your day will go. Are you going to set yourself up for a 10am blood sugar crash which will be repeated several times throughout the day, or will you choose something that will keep you full and balanced until your next meal or snack? Most standard breakfast options like cereals, pancakes, pastries, and flavored yogurts will set you up for the spike and crash option. Why? Because of all the sugar and refined flours (which behave like sugar in your body) that these desserts masquerading as meals contain. To help you stay on track you should include a bit of protein and fat and choose whole grain options at every meal, not just breakfast. This mix will help keep you full and help you avoid the mid afternoon sugar snack attack. But what can you do if you still want something sweet? Fruit! But fruit alone will not fuel you until lunchtime; you’ll need to get creative. I’ve made these savory-sweet quesadillas for breakfast a few times now and not only are they super tasty, with a subtle sweetness to them, but they are really satisfying as well. The original recipe I found called for mozzarella, but I chose goat cheese because it has a much stronger flavor, and I can get away with using a lot less of it without feeling like I’m depriving myself. I haven’t tried it yet, but I think apple-brie would also be a nice combo. A cup of Greek yogurt served alongside this would make for an extremely satiating meal. 1. 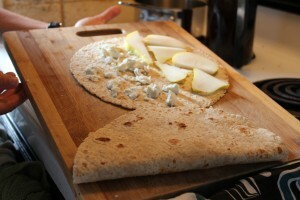 Place cheese and pear slices on on half of the tortilla and fold in half. 2. Heat skillet on medium heat, then place folded tortilla in pan. Cook until lightly browned, pressing the quesadilla with a spatula to seal. Carefully flip and brown other side. Cut in half and serve immediately. Nutritional Information per quesadilla: 244 calories, 11g fat, 24g carbs, 10g fiber, 13g protein.